We are pleased to invite you to participate in a marketing opportunity designed to benefit you by the St. Marys Area Chamber of Commerce. This is your chance to have your company's name included on the list of participating businesses that accept Chamber Bucks. This program has proven to be beneficial to the community and encourages shopping locally. 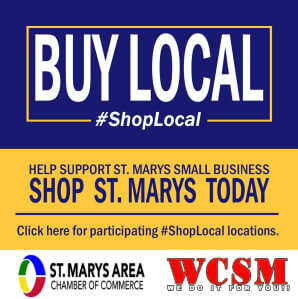 There is no fee to participate in the St. Marys Area Chamber of Commerce Chamber Bucks Program. To participate you must be a Chamber member. Contact the Chamber office at 419-300-4611, if your business would like to participate. When accepting Chamber Bucks, your business will treat them like cash (no change is to be given), write your business name on it, and bring it to the Chamber office for redemption. You may do this weekly or monthly; its up to you! Your business will be reimbursed by check for the total amount of Chamber Bucks within one week. Last year the Chamber sold over $3,000 in a one month period! Your company could capture some of that business. Chamber Bucks will be available for the community and businesses to purchase the entire year. Chamber Bucks are available in $5, $10, and $25 denominations and expire one year after purchase. 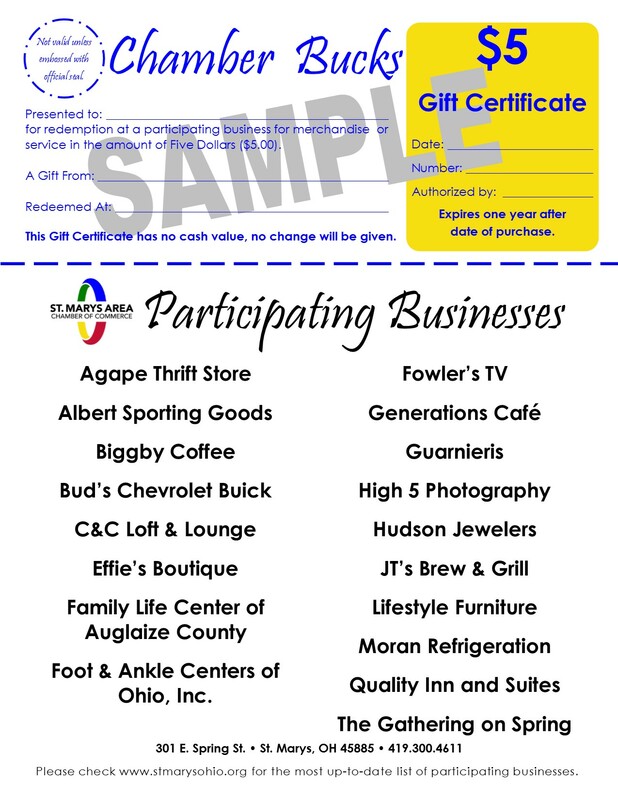 This program allows the recipient of the Chamber Bucks to choose where and how they would like to use the gift certificate while keeping the money among local Chamber Members. Participants include gas stations, restaurants, retail stores, pharmacies, auto repair shops, and more. Foot & Ankle Centers of Ohio, Inc.